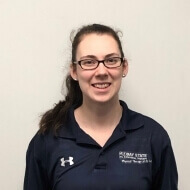 Erin received her Bachelor of Science in Exercise Physiology in 2014 and her Doctorate of Physical Therapy in 2018, both from the University of Massachusetts Lowell. She has clinical experience with a variety of orthopedic and neurological conditions in outpatient orthopedics and acute care settings. Erin’s current clinical interests include working with patients with various orthopedic injuries such as pre and post-surgery patients, lower back, knee, and shoulder pain. She also utilizes aquatic therapy to help patients achieve their goals and become more independent following therapy. She is a current member of the APTA. Outside of her time at Bay State Physical Therapy, Erin enjoys spending time with her friends and family and stays active by running and strength training. She is a passionate sports fan, especially the Boston Celtics and the New England Patriots.